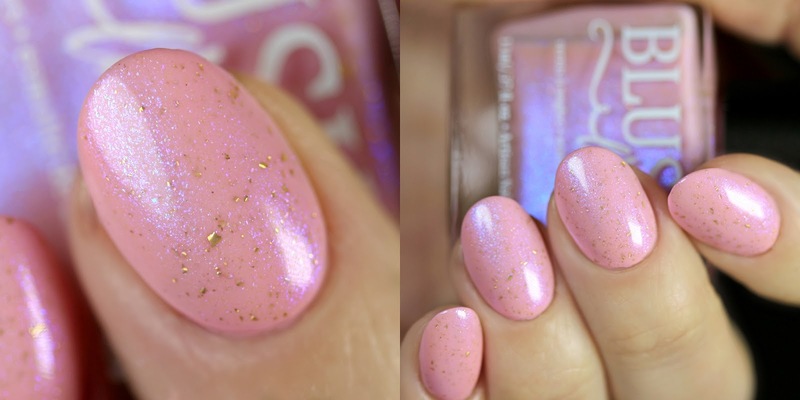 We can welcome a new brand on the blog: Blush Lacquer. We have their new Spring release, which consists of a 6 piece shimmer collection and a 6 piece creme collection. It's a pale, green/cold toned yellow crelly base with gold flakes and green-orange-pink shimmer flakes. 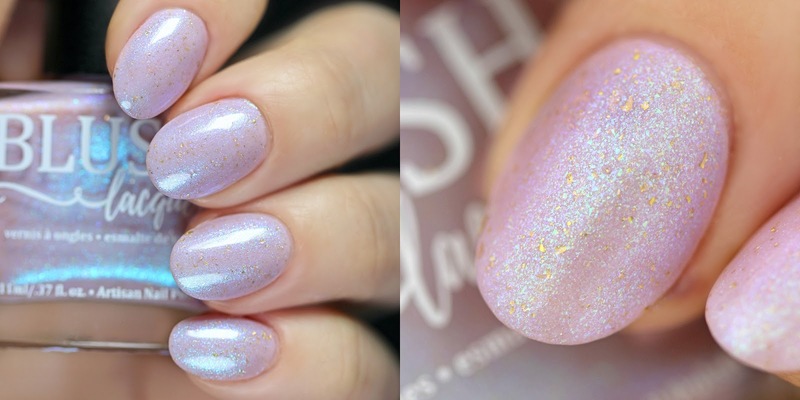 It's a pale lilac crelly base with gold flakes and icy blue-turquise-pink shimmer flakes. 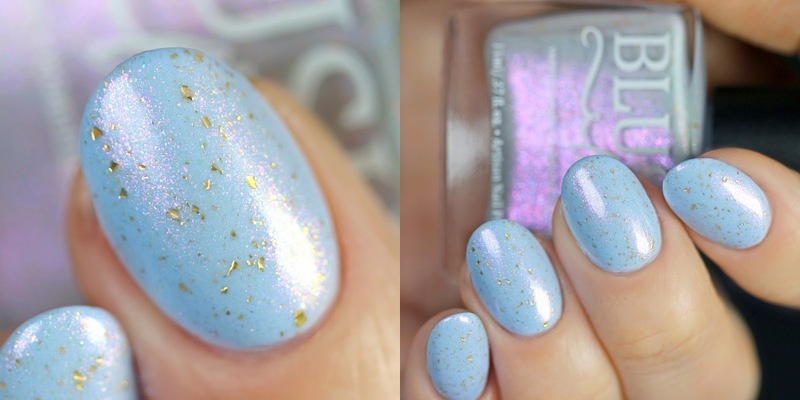 It's a pale turquoise crelly base with gold flakes and green-yellow-orange-pink shimmer flakes. 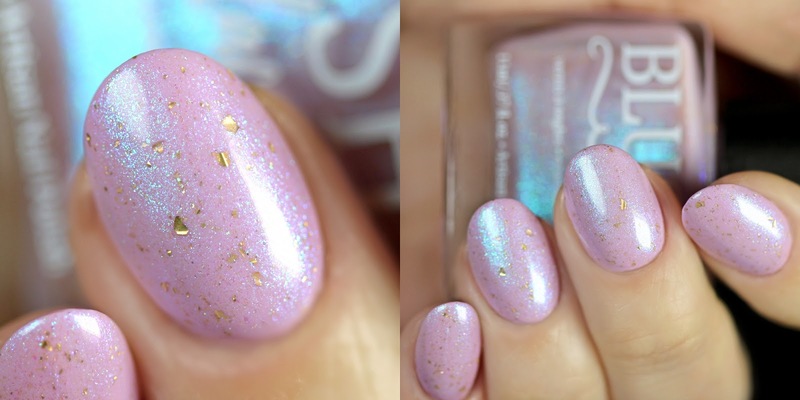 It's a really pale icy blue crelly base with gold flakes and violet-pink-orange-yellow shimmer flakes. 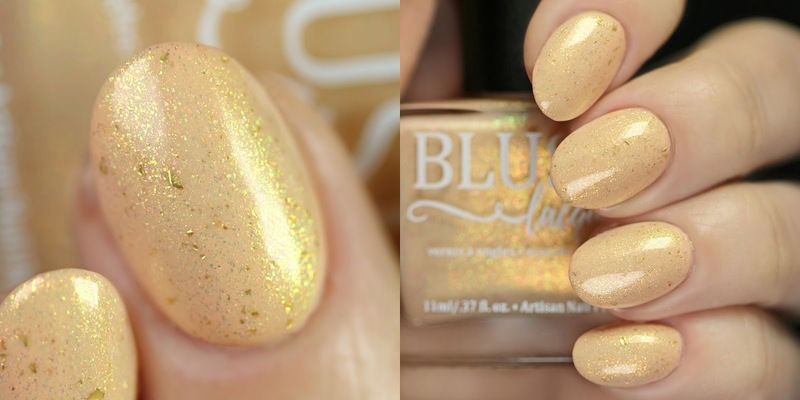 It's a pale melon crelly base with gold flakes and green-gold-orange shimmer flakes. 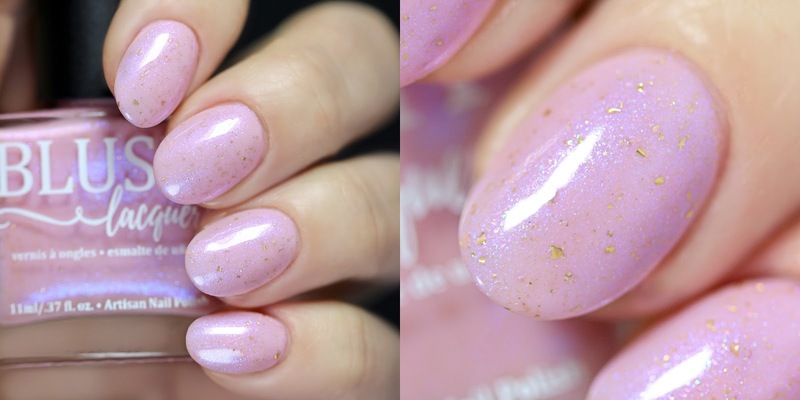 It's a pale pink crelly base with gold flakes and blue-violet-pink shimmer flakes. And now let's see the creme polishes. The formulation is leaning towards a crelly, so they all needed 3 coats to cover entirely. I was asked to try out the shimmers on top of the cremes, I used 1-1 coats of each of the shimmers. This way the creme color will intensify the base color of the shimmers a little bit and the gold flakes stand out a lottle bit better. It's a pale, green toned pastel yellow creme/crelly. It's a pastel melon/peach creme/crelly. It's a pastel pink creme/crelly. It's a pastel lilac creme/crelly. 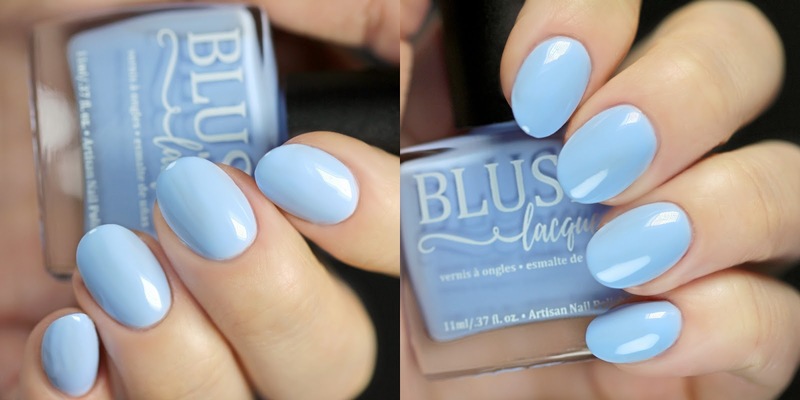 It's a pastel cornflower blue creme/crelly. It's a pastel turquoise creme/crelly. My absolute favorite from the cremes is Kiss Me, and from the shimmers I really like Silver Lining, Lilac Dreams and Tidal Reflections. All of these shades are available right now at the Blush Lacquer website, and stockists like Hypnotic Polish or Color4Nails.